The 1949 Ford was revolutionary when it was introduced in the spring of that year. 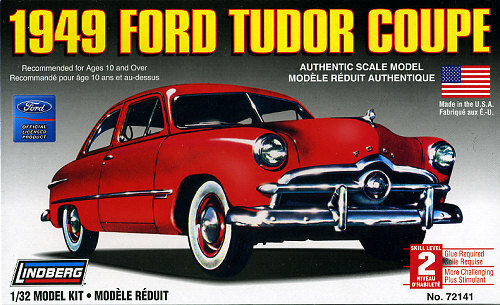 After the second World War, Ford Motor Company had been producing only remodeled designs of their 1942 automobile. Sleek and slab-sided with the trademark circle in the front grille, the 1949 Ford broke from previous ideas of design and engineering. By the late 1940s, the dominance of the Big Three was more apparent than ever. The 1949 Ford symbolized the company's revitalization under Henry Ford II, who had taken over for his grandfather in 1945. Modern management methods and dramatically new products returned Ford to second place in sales. Finding the company in total disarray, Henry Ford II lured Ernest R. Breech from the presidency of Bendix Aviation Corporation to be his executive vice-president and implement the recovery of Ford. Henry Ford II also lured in a dynamic management team to overhaul the company, including ten Harvard-trained ex-Air Force officers dubbed the Whiz Kids. These men all managed to pull Ford back into prominence, but it was as much due to the dynamic styling of the 1949 Ford as it was anything else. Lindberg is one of America's oldest plastic companies and has recently been sold to J. Lloyd International. This company has the capital to allow it to do a rather aggressive reintroduction of many of Lindberg's kits, some of which have not been available for a very long time. One of those kits is the 1949 Ford Tudor Coupe. This 1/32 scale kit is not at all like what you are currently used to seeing. 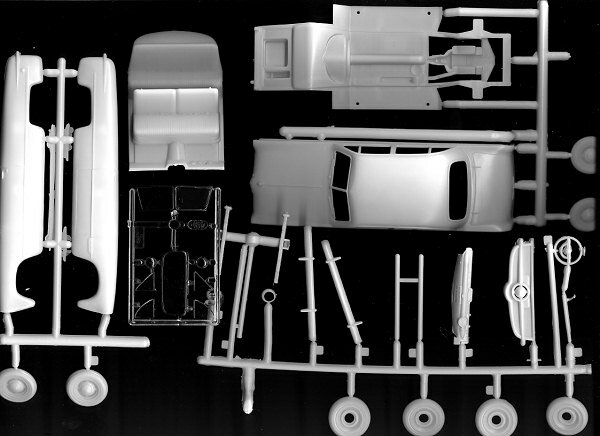 Nowadays, car kits come with one piece bodies, but it wasn't always like that and this one is molded with a top section and separate sides with a separate grille section. Though the kit does have a somewhat complete interior, it is strictly a curbside with no engine. The kit also has no chrome so the builder is going to be tasked with painting a lot of parts with the most highly polished paint around. Like Alclad II Bright Chrome. Another option would be to use Bare Metal Foil Chrome. I'm sure that many will use a combination of both. Despite the age of the molds they are in very good condition with only a trace of flash. As you'd expect, this one has all plastic wheels and plastic axles as well. The clear bits are not bad, but they are a bit distorted and while not crystal clear, are quite useable. Instructions are just like the originals though it seems they are reduced in size to put all the barely legible warnings in multiple languages. There are two construction diagrams and they have suffered from a lot of photo reproduction. Fortunately this is not a difficult kit in terms of parts. No painting instructions are provided so you are pretty well on your own in this regard. While I doubt if many will get this model looking as nice as the box art, it is still one worth pursuing and at $8.25 it certainly won't break the bank. I'm rather glad that these kits are returning as I've a fondness for these older cars and look forward to seeing others in the series.